The first reported case of herbicide resistance in the United States was reported in the 1950’s. Field bindweed resistant to 2,4-D was reported in Kansas in 1964, and common groundsel resistant to triazine herbicides was discovered in Washington in 1970. Beginning in the 1980’s, the number of reported resistant biotypes began increasing rapidly in the U.S. and worldwide. Resistance to one or more of 25 herbicide families has been observed in more than 65 weed species in the U.S. Following greenhouse or field studies to confirm heritability of the resistant trait, herbicide resistant weeds are documented in the International Survey of Herbicide Resistant Weeds at www.weedscience.org. 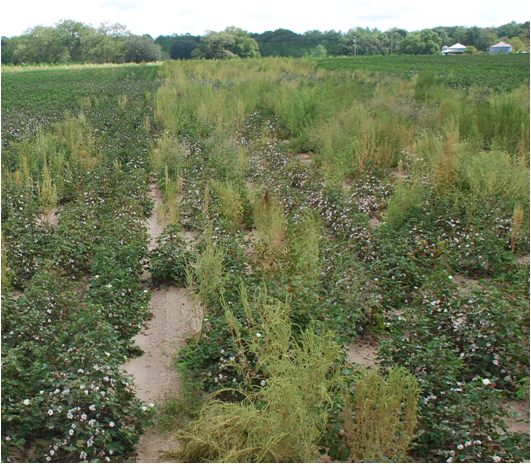 Herbicide resistance has been a greater problem with some modes of action than with others. The greatest number of resistant biotypes worldwide has been observed with the ALS inhibitors (imidazolinones, pyrimidinylthiobenzoates, sulfonylureas, triazolopyrimidines). The second most common group with resistant biotypes is the photosystem II inhibitors (primarily triazines). Note that no resistant biotypes have been reported to some mechanisms of action, to date. Part of this is obviously due to the extent of usage of some herbicide groups. There are numerous ALS inhibitors, for example, and they have been widely used. On the other hand, there are few cellulose inhibitors and they have been used on comparatively fewer acres. However, some modes of action are more prone to resistance than others. The ALS inhibitors and ACCase inhibitors appear to be at high risk; this should be considered in management plans. Dinitroaniline and triazine herbicides appear to have a medium level of inherent risk while chloroacetamides and synthetic auxins have a low inherent risk. It is important to remember that a low inherent risk for resistance combined with extensive use can result in a higher risk potential. For example, glyphosate was generally considered to have a low inherent risk of resistance evolution. However, with the widespread use of Roundup Ready crops, glyphosate is being used extensively in the absence of other weed control methods, thus greatly increasing the incidence of resistance.